The money would fund improvements to disabled transit riders while also making roadways safer for pedestrians and cyclists. Improved accessibility is a critical part of New York City Transit President Andy Byford’s “Fast Forward” plan, which aims to add 50 accessible subway stations to the system in the next five years — up from 100 or so today — and make the system fully accessible by 2034. The overall cost of Fast Forward has been estimated at $40 to $60 billion. Advocates fear that accessibility — which has risen to the top of the agenda in the days since a young mother died in a fall at a Midtown station that lacked an elevator — will be jettisoned if the governor and state lawmakers don’t come up with all the money to fund it. 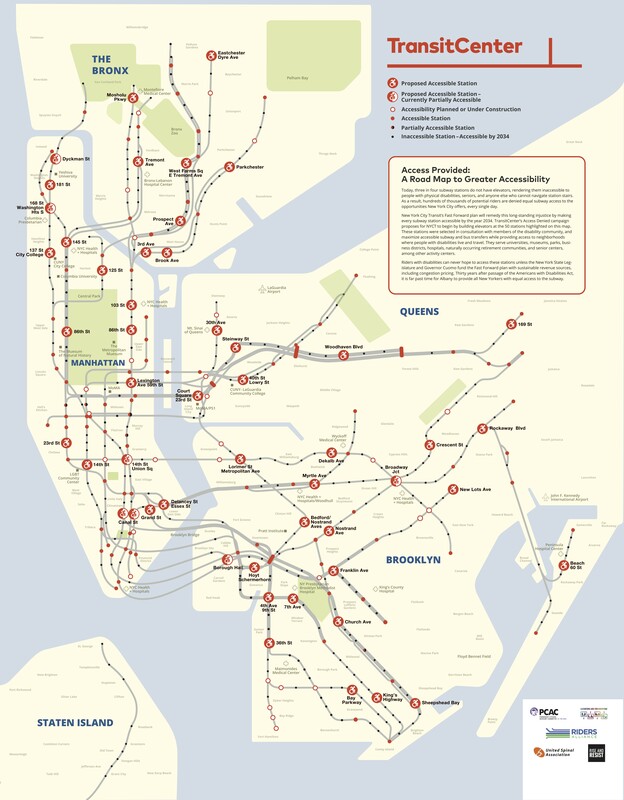 Wright and other advocates released a map highlighting the 50 stations that need to be renovated first — and it differs from the MTA agenda. Transit Center said it chose stations for accessibility improvements based on criteria that included location (major express stations and transfer points to subway and bus routes were the highest priority); population demographics (stations near high populations of low-income and disabled residents); current demand (as determined by Access-A-Ride usage data); and finally the appeal of the destination (stations serving universities, business improvement districts, museums and parks, senior centers, hospitals, and naturally occurring retirement communities earned extra points). 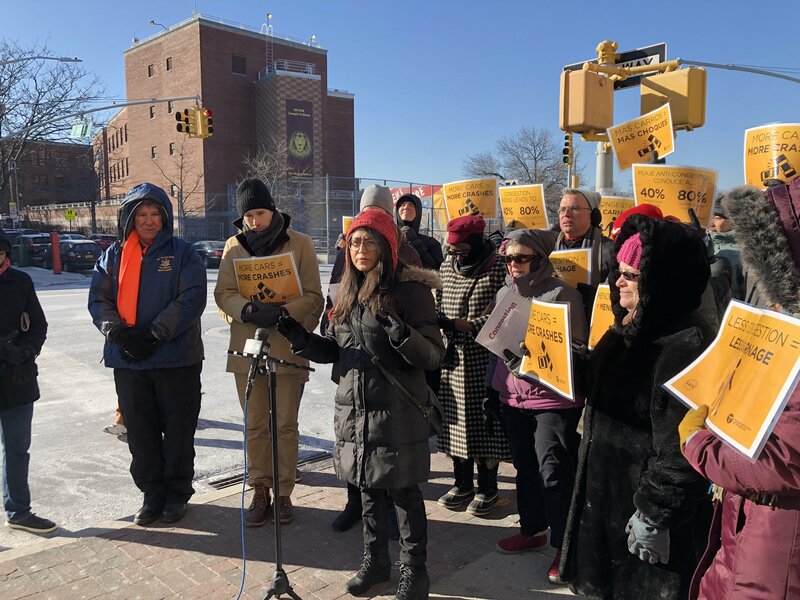 Meanwhile in Queens, a cold band of advocates heralded safety improvements that could result if congestion pricing passes. Members of Transportation Alternatives, Families for Safe Streets and Make Queens Safer rallied on Northern Boulevard, not only because it earned the gruesome nickname, “The New Boulevard of Death,” based on its eight pedestrian deaths and hundreds of injuries since 2012, but because its location has made it a speedway for motorists, many of whom might not be using the roadway if congestion pricing passes. According to Transportation Alternatives, total crashes fell by 40 percent, and the bicyclist crash rate fell by 80 percent, after congestion pricing was enacted in London. estimated $15 billion per year for major capital improvements by the MTA. The most optimistic projection, Komanoff’s Balanced Transit Analyzer, predicts an annual net of $1.980B of which only $1.2B would be spent annually on capital improvements. Northern Boulevard is not located in the Central Business District so congestion pricing won’t reduce vehicles on that roadway. Considering that less people will use Northern Blvd to drive to the Manhattan CBD, there will likely be a decline. Or, many people will use Northern Blvd to reach Long Island City as a park-n-ride lot when switching to the subway or ferry. Fewer cars will mean less pollution, which benefits everyone, but especially kids. The senior lobbying group supports congestion pricing, even though opponents of congestion pricing often cite seniors as their reason for opposing tolls.